I loved buying those cheesy cartoon valentines as a kid and sharing them with my class. They always had those really bad puns: Bee Mine with a bee flying around. I also love Stephanie Congdon Barnes love notes for her more elegant puns (along with the beautiful objects, of course!). Besides the awesome punning, when you're a kid, you give a valentine to everybody (or most everyone) without so much emphasis on romantic love. This year I keep thinking of people I love that I want to send a valentine. So I made up a few valentines of my own - and when I couldn't come up with any good puns, I decided to make visual puns. 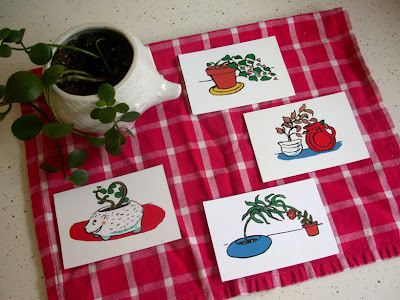 These are inspired by my houseplants, who inspire a little love every day. If you waited till the last minute like me, you might enjoy this freebie! They are 3.5x5 each, so you can print them on card stock and mail them like postcards - or just slip them somewhere your loved ones will find them. Click on the image to take you to flickr where you can download the full size image.